To see the parrot, simply color the spaces according to the key. 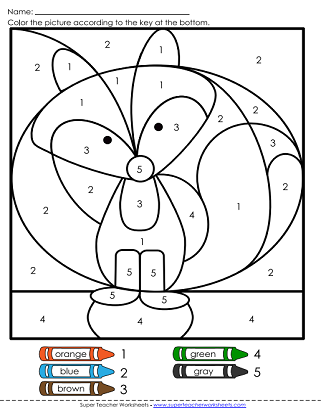 An adorable fox is colored in as children color by following the key. Students use the coloring key to color in a picture featuring a friendly robot! Reveal the rooster by correctly coloring this picture. Don't get too carried away when you color this hot air balloon illustration. A bright clown fish appears when this one is colored correctly. Color the beach scene with pail and ball according to the number key. Color the water scene featuring a sailboat. To see the blue whale picture, students will need to correctly color the spaces according to the crayon code at the bottom. Color this picture according to the number-color key to reveal an airplane flying through the sky. When you complete this bird color-by-number, be sure to TWEET a picture of it to all of your friends. This illustration is a beautiful, colorful butterfly picture. See the pumpkin when you color the picture according to the number key. Gobble gobble. Enjoy this Thanksgiving color-by-number picture. Students will reveal a Christmas stocking when they complete this color-by-number activity. You'll want to give this completed color-by-number to your favorite Valentine. You'll see the lucky leprechaun in this picture. 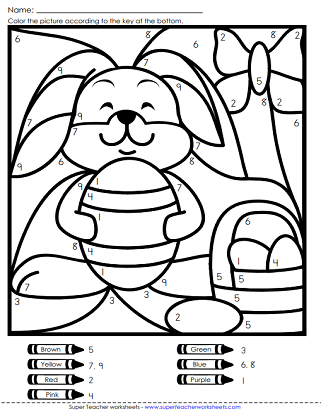 Can your students complete this Easter bunny picture? 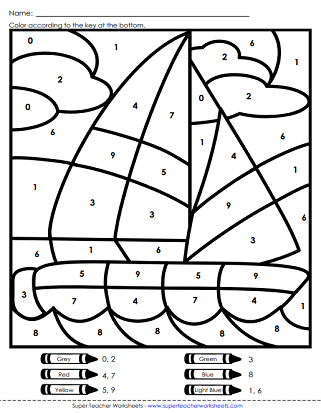 The same types of pictures as color-by-number activities on this page, but they cover multiplication, addition, subtraction, and division. Learn to count up to 20.